1. Preheat oven to 180°C/350°F/Gas 4. Line bun tin with baking cases. 2. Beat the butter and sugar together until light and fluffy. Gradually beat in the eggs, milk and the vanilla essence. If mixture starts to curdle, add a little of the flour. 3. Gently add remaining flour and sieve in the baking powder, mix to combine. Place spoonfuls of the mixture into the baking cases and bake for 15-20 minutes until firm to the touch. 4. Remove from the oven and leave on a wire tray to cool. 5. Make buttercream by beating the butter, icing sugar and vanilla essence together until smooth and creamy. 6. If desired, divide the icing into separate bowls for each colour you want to use, gradually add colouring and mix well until required colour is achieved. 7. Pipe or swirl icing onto each cupcake. 8. Make chocolate nests by adding broken shredded wheat into the melted chocolate, shape into a nest, leaving a hollow centre. Allow to cool. When cold put some mini eggs into the nest. 9. 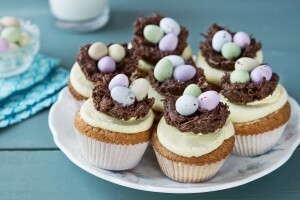 Top cupcakes with chocolate nests and mini eggs. Happy Easter!